Those who know me know that I am a serious map junkie. I have numerous maps hanging on my walls and I can study atlases and maps ad infinitum (some would say ad nauseum) just for the sheer pleasure of knowing where things are. This being understood, it was with great delight that I received an unexpected gift a few days ago. My family has a large cabin across the street from my house that we use as a guest house, making it available anyone who wants to vacation in the Mount Shasta area. During the summer the family of some of our friends stayed there for a week or so and a really neat map was a gift of thanks for the use of the house. While this gift was unnecessary, it was greatly appreciated. Some of the maps characteristics are noteworthy. First is the aesthetics of its presentation. The map was reproduced, framed and matted to look rustic, which is fitting considering the map was originally drawn in 1883. This was put together by Mount Shasta Wild Crafts, a local business here in Mount Shasta (full disclosure: I have no knowledge of who is involved with this business and no connection to it). While their website is not fully up and running, I was able discern that they produce items that are locally themed and highlight the outdoors. 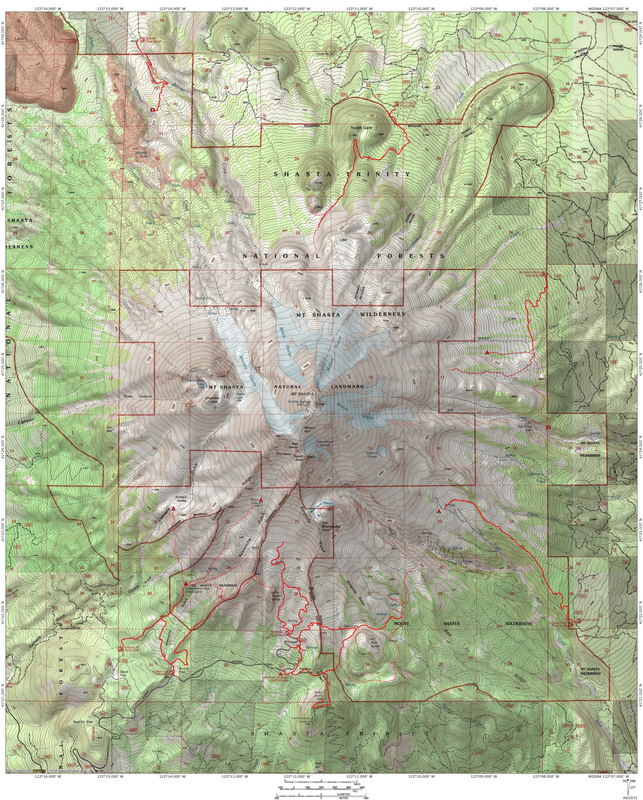 If the map given to me is indicative of their style, I hope they produce a broader line of Mount Shasta related stuff. The great presentation only serves to highlight the map itself. As noted, the map was produced in 1883 by cartographer Gilbert Thompson. Though he is often rembered as one of the founders of the National Geographic Society, he was also a member of the famed Wheeler Survey, which travelled much of the Southwest. The Wheeler Survey was one of three great survey expeditions of the west that were conducted after the Civil War. The other two surveys, conducted by Clarence King and John Wesley Powell were joined with the Wheeler Survey in 1879 to form the United States Geologic Survey. Interestingly, these there surveys all have diverse connections to Mount Shasta, but this will have to be the subject of a later blog post. The salient fact is that Gilbert Thompson drew the map after having visited Mount Shasta. His visit was under the auspices of the USGS, not the Wheeler Survey, though he did come to the mountain in the company of Powell. Though the map is technically a sketch rather than a topographic map, it was one of the first accurate representations of the mountain produced. Though not exactly to scale and not totally accurate in its overall representation, most of the mountain’s major features are all present. The major canyons and ridges are obvious, including Sargents Ridge, Casaval Ridge, Avalanche Gulch, Diller Canyon and Mud Creek Canyon. Of course, most of these names had not been adopted yet, so they are untitled on the map. Shastina also features very prominently on the map. It is given a somewhat more rounded appearance than it ought, but the overall likeness is good. 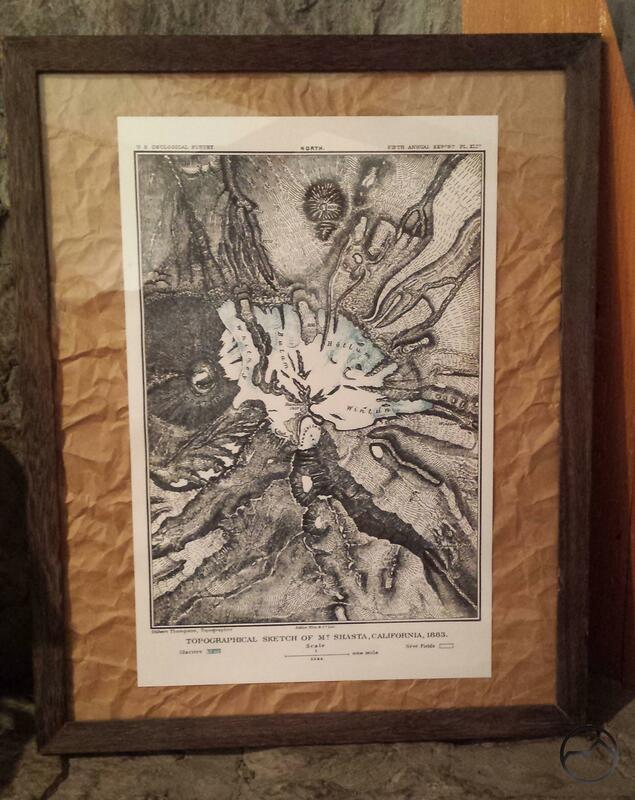 It is notably dubbed Shastina Crater and the crater figures prominently on the sketch. This is one of many features on the mountain that are not obvious from the foot of the mountain. Perhaps the most striking feature of the sketch is the glaciers. Only five the seven Mount Shasta glaciers are named, the final two not being named until the 1930’s and 1970’s. The Bolam, Hotlum, Wintun and Konwakiton Glaciers were all named by Powell at the same time that Thompson drew the sketch. A few minor historical details are worth noting. First, the two most impressive waterfalls on Mount Shasta bear names other than those currently used. Ash Creek Falls is identified as Wintun Falls. Likewise, Mud Creek Falls is marked as Konwakiton Falls. In both cases the cataracts bear the names of the glaciers that are the source of their waters. Now both waterfalls are named for the creeks that form them. There is a second waterfall many thousand feet above Mud Creek Falls that is now unofficially referred to as Konwakiton Falls. It visible a below the eponymously named glacier. Another interesting detail is the recognition of the climbing route through Avalanche Gulch. On the sketch, the route is named the “Sissons Trail”. Even in 1883 this was a well-established way to climb Mount Shasta. That is a fabulous gift and a really beautiful and unique map. You must be thrilled to have it.